At a meeting of the European Union’s General Affairs and External Relations Council in Brussels on May 26 of last year, Poland, seconded by Sweden, first proposed what has come to be known as the Eastern Partnership, a program to “integrate” all the European and South Caucasus former Soviet nations – except for Russia – not already in the EU and NATO; that is, Armenia, Azerbaijan, Belarus, Georgia, Moldova and Ukraine. Which is to say, to isolate Russia from six of the other eleven CIS states, with the remaining five, in Central Asia (Kazakhstan, Kyrgyzstan, Tajikistan, Turkmenistan and Uzbekistan), simultaneously targeted by a complementary EU initiative. Coming out of last year’s NATO summit in Romania the increased political, security and military integration – one is tempted to say merger – of the EU and NATO, trumpeted by France’s President Nicolas Sarkozy and Foreign Minister Bernard Kouchner, warmly embraced by the Bush administration and since affirmed most strongly by British Foreign Minister David Miliband at the recent Munich Security Conference, is the yet further consolidation of the longstanding EU-NATO “soft power, hard power” division of labor mutually agreed upon. The Eastern Partnership was first proposed in May of 2008 as mentioned earlier, but the impetus to endorse it at a meeting of leaders last December was the “soft power” response by the EU to complement NATO’s establishment of the NATO-Georgia Commission a month after Georgia’s invasion of South Ossetia triggered last summer’s Caucasus war. The EU will provide the “diplomatic” persuasion and the economic subsidies as NATO and its individual member states (in almost every instance in Europe the same as the EU’s) continue to supply Georgia with advanced offensive arms, surveillance systems, military training and permanent advisers. Armenia and Belarus are both in the second tier of Eastern Partnership candidates and will require a good deal of “improvement” before being absorbed into the West’s new “soft power” drive to the east. Both are members of the Collective Security Treaty Organization (CSTO) with Russia and four Central Asian nations (all except for Turkmenistan), which has in recent years taken on a more overt military mutual defense nature. The deadly “Daffodil Revolution” in Armenia a year ago and the attempted “Denim Revolution” in Belarus two years before having failed to replicate their predecessors and prototypes in Georgia in 2003, Ukraine in 2004 and Kyrgyzstan in 2005, other means were required to “reorient” the two nations from their close state-to-state and security relations with Russia. As will the simultaneous and complementary Brussels program aimed at Kazakhstan, Kyrgyzstan, Tajikistan, Turkmenistan and Uzbekistan, itself mirroring U.S. and NATO military and energy plans for Central Asia. “[T]his latest EU action could entail another consequence, one that few appear to be thinking about now. “In the early 1990s, the United States took the lead in pushing the idea that EU membership for East European countries could serve as either a surrogate or a stepping stone to NATO membership. Two days ago the last American ambassador to the Soviet Union [1987-1991], Jack Matlock, “explained Russian motivations and highlighted what he considered to be American hypocrisy in geopolitical affairs. While America has claimed nearly monopolistic power in the Western Hemisphere for 200 years, Matlock said, it has increasingly denied Russia its own regional sphere of influence since the fall of the Soviet Union. Sikorski was alluding to the Mediterranean Union project of French president Nicolas Sarkozy, which in July 13, 2008 was renamed the Union for the Mediterranean, the southern wing of the European Union’s “push east and south” (U.S. State Department phrase for its own emphasis in and from Europe), the eastern complement of which is, of course, the Eastern Partnership. The Black Sea Synergy project is synergy not as in the word whose adjective form is synergistic but as in syn + energy. Of the six nations targeted for the Eastern Partnership two, Georgia and Ukraine, are on the Black Sea and one, Azerbaijan, is a Caspian Sea littoral state. The Eastern Partnership is designed among several other purposes to complement the Union of the Mediterranean and to augment the Black Sea Synergy program as an integral and advanced component of the West’s campaign to dominate world energy supplies and transit and to provide the civilian supplement to NATO’s expansion throughout Eurasia, the Mediterranean, Africa and the Middle East. GUAM was set up by the West in 1997 to accomplish several strategic objectives: As a Trojan Horse within the Commonwealth of Independent States – until Georgia withdrew after the war last August all four GUAM member states were in the CIS – it was intended to undermine and ultimately dissolve the community, eventually luring other CIS states away from it. The inclusion of Armenia and Belarus in the Eastern Partnership is an example of this strategy. The GUAM states are involved in all four of the so-called frozen conflicts in the former Soviet Union: Georgia with Abkhazia and South Ossetia; Azerbaijan with Nagorno-Karabakh; Moldova with Transdniester (Pridnestrovie). In fact there are several other unresolved territorial disputes in the GUAM states including Adjaria (suppressed and occupied by Georgia in 2004 after a show of force by Saakashvili’s American-trained and -equipped army, the first example of the “peaceful resolution of a frozen conflict”) and the ethnic Armenian inhabited area of Samtskhe-Javakheti/Javakhk in Georgia; Gaugazia in Moldova; and the Crimea and potentially even the Donetsk region in Ukraine. The four frozen conflicts proper – Abkhazia, Nagorno-Karabakh, South Ossetia and Transdniester – are illustrative of the cataclysmic consequences of the precipitate breakup of the Soviet Union in 1991. All four former autonomous republics seceded from the respective ex-Soviet Socialist Federal Republics they had belonged to, in all cases also entailing armed conflict and loss of life. 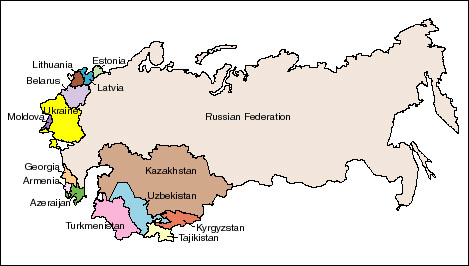 The four, and the other potential conflict areas mentioned above, for example Crimea in Ukraine, part of Russia for almost two centuries until being ceded to the Ukrainian Soviet Socialist Republic in 1954, had belonged to the federal republics they did until 1991 only within the context of the broader Soviet framework; once the latter ceased to exist, so too did the rationale for the autonomous republics remaining within new states that had never before existed as nations – Moldova and Ukraine – or, if so, not for centuries except for a three year period during the Russian civil war with Georgia from 1918–1921 and a two year interlude with Azerbaijan from 1918–1920. The U.S. and its NATO allies are past masters at fishing in troubled waters and in troubling the waters the better to fish in them, and the frozen conflicts in the former Soviet Union allow the West to impede integration processes within the Commonwealth of Independent States, develop close military ties to the nations involved with them and increasingly to intervene in post-Soviet territory under the auspices of peacekeeping operations whether through the Organization for Security and Cooperation in Europe (OSCE), the European Union or, the ultimate objective, NATO. Most dangerously, the U.S. and all its NATO allies have refused to ratify the 1990 Conventional Forces in Europe (CFE) arms treaty – which has only been approved by Belarus, Kazakhstan, Russia and Ukraine (as successor states to the former Soviet Union) – and have justified their non-ratification by linking it to the withdrawal of small Russian peacekeeper contingents – mandated by the Commonwealth of Independent States and in at least one instance the United Nations – from Abkhazia, South Ossetia and Transdniester. In the eighteen year interim since the treaty was negotiated until now numerous new nations have been created in Europe – Bosnia, Croatia, Estonia, Latvia, Lithuania, Macedonia, Moldova, Montenegro, Serbia, Slovakia and Slovenia (and of course the pseudo-state of Kosovo) and in the South Caucasus Armenia, Azerbaijan and Georgia – which are not signatories to the CFE and which then could have American and NATO forces and arms stationed on their territories without any provisions made for Russia and the three other nations that have ratified the treaty to monitor them. At the 2006 summit in Kiev, Ukraine GUAM expanded its name to GUAM -Organization for Democracy and Economic Development, declared itself an international organization and announced the creation of a joint military (alleged peacekeeping) force. “The creation of the bloc is a bold step in promoting energy supply routes linking the Caspian Sea basin and consumers in the E.U. allowing to reduce heavy dependence on Russian energy. The following year at its summit in Baku, the capital of Azerbaijan, a GUAM-U.S., GUAM-Japan, GUAM-Visegrad Four (Czech Republic, Hungary, Poland, Slovakia), GUAM-Baltic and other new partnerships were launched. In November of 2007 the U.S. hosted a meeting of GUAM states national coordinators in Washington where “A special topic of the discussions was the assessment of the potential of Caspian Sea networks in the consolidation of the GUAM states’ energy security and the present-day shape of the Nabucco Project.”  The latter is a proposed tran-Caspian natural gas project promoted by the West to squeeze Russia out of the European energy market. At the 2008 GUAM summit in Batumi, the capital of Georgian-subjugated Adjaria, “The sides [chartered a] course for the development of regional cooperation as a part of the European and Asian integration processes, and for strengthening partnership relations with the US, Poland, Japan and other states as well as international organizations. The turning point in the West’s resolve to back its GUAM, and now Eastern Partnership, clients to definitively “solve” the issue of the frozen conflicts came at the NATO summit in Bucharest, Romania in April of last year. All twenty six Alliance members affirmed that Georgia and Ukraine, the most pro-American and pro-NATO of the four GUAM and six Eastern Partnership states, were on an irreversible road to full NATO accession but baulked at granting them a Membership Action Plan, the final stage to complete integration. Two central barriers to a nation joining NATO are unresolved conflicts in and foreign (that is, non-NATO nations’) bases on their territories. At the beginning of last August Georgian shelling killed six people, including a Russian peacekeeper, and wounded twelve on the outskirts of the South Ossetian capital and on August 7 Georgia’s American-armed and -trained military forces crossed the border and laid waste to much of the capital. The assault, coming only days after the Pentagon had completed a two week military drill, Exercise Immediate Response 2008, under the sponsorship of NATO’s Partnership for Peace program with troops from Georgia, Armenia, Azerbaijan and Ukraine, weeks after Secretary of State Condoleezza Rice had visited the Georgian capital and hours after Georgia’s Saakashvili had proclaimed a unilateral ceasefire, led to direct military hostility between Russia and the preeminent client of the U.S. The above occurred as the U.S. sent a flotilla of warships to Georgian ports on, and NATO boosted its naval presence in, the Black Sea. In the middle of last November an energy summit was held in the Azerbaijani capital of Baku and attended by the presidents of Ukraine, Turkey, Poland, Estonia, Latvia, Romania and Georgia and other heads of states. The meeting was overseen by U.S. Energy Secretary Samuel Bodman and special envoy of the American president for Eurasian energy issues Boyden Gray. The main focus was on the Caspian-Black Sea-Baltic, Odessa-Brody-Gdansk oil pipeline project but also included as the Agence France-Presse dispatch earlier alluded to the Nabucco natural gas mega-project which is to take in North African and Persian Gulf as well as Caspian energy resources and transit lines. While at the summit, U.S. Energy Secretary Bodman effused that the “Baku Energy Summit is the continuation of ‘The Contract of Century’ signed in 1994,” an allusion to the contract signed between American and Western companies and Azerbaijan in that year which laid the foundation for the subsequent trans-Eurasian Baku-Tbilisi-Ceyhan oil and Baku-Tbilisi-Erzurum gas pipelines as well as the Nabucco project. A European Commission report of a few days later included the demand that “The EU must significantly boost relations with Ukraine and five other ex-Soviet republics and make easing Moscow’s sway over them a priority. The report says the EU must seek “diversification of energy routes by enabling the ex-Soviet nations to build new and better connected pipelines and oil and gas storage facilities. On December 19 Washington signed a United States-Ukraine Charter on Strategic Partnership with its compliant client in Kiev, Viktor Yushchenko, and within a week the Ukraine-Russia gas dispute began, plunging much of Europe into a crisis and renewing Western calls for – as was to be expected – energy routes circumventing Russia. Dispensing with the standard verbs like assisting and aiding, he added another one – stabilizing. “The European Union launched, on 28 November, a rule of law initiative for Central Asia – one of the key elements of its strategy for a new partnership with five Central Asian countries adopted in May 2007. Exploiting the issue of alleged European energy security, a campaign first addressed in a major manner by NATO Secretary General Jaap de Hoop Scheffer at the Alliance’s 2006 summit in Riga, Latvia, the real intent of the Eastern Partnership is to subordinate eleven of the twelve former Soviet states not already in the EU (and NATO) to Brussels…and Washington. By adding Belarus, either through cooptation or “regime change,” to the Western column Russia will lose its only buffer against NATO in Europe and the only substantive early warning missile surveillance and air defenses it has outside its own borders.